Electronics are ubiquitous with everyday life in the 21st century. From your smart phone to your laptop, your fitness wristband to your iPod, we’re always wired in! These devices have become a critical part of most of our everyday lives, which makes it important that they last as long as possible. 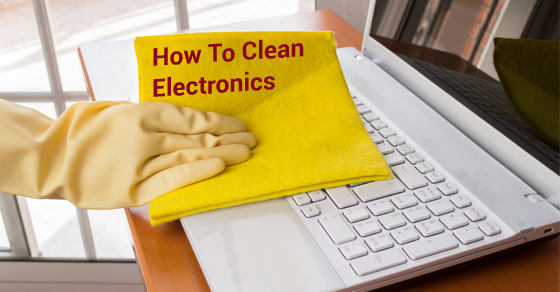 One of the most important steps to keeping your electronics in tip-top shape and in working condition is cleaning them. That said, given the delicate nature of these items, you also need to be very careful with what products and techniques you’re using. LCD screens are extremely delicate, and using harsh chemicals can permanently ruin their finish and protective coating. To properly clean your monitor (or other gadget’s screen), turn off the device, and grab a microfiber cloth that has been moistened with the slightest amount of water. For super stubborn spots, use an electronic wipe. These are similar to the wet naps you find in some restaurants, but are make specifically for these delicate products. Whatever you do, don’t press hard as this can burn out the pixels on your screen. For slightly-to-moderately dirty keyboards, compressed air should to the trick. Simply blow it between keys to get rid of the dust. If the keys are dirty, apply a bit of rubbing alcohol to a q-tip and give it a light scrub. For extremely dirty keyboards, you might have to pop out the keys and clean them with a small brush. Whatever you do, make sure the keyboard is unplugged and turned off before you start. As soon as you spill something on any electronic equipment, turn it off and unplug it to avoid internal damage. Wipe up as much of the spill as possible with paper towel, and then assess the situation. Hopefully the spill was only on the surface, in which case you’re probably in the clear! In the event that some seeped inside, you could be in trouble. Your first step is to let the spill dry out. Many people have success by placing their device in a bowl of dry rice for 24-hours week. Whatever you do, don’t try turning it on during this time! Wait until the rice has absorbed any water from within the device and try turning it on after this duration. Your other option (if you’re particularly handy) is removing the cover pieces of your device to thoroughly wipe out the inside. Be warned, however, that this often voids your warranty. In the event that you’re dealing with a major spill, it’s often a better idea to take it straight to a professional to avoid completely ruining your device.